Nepal is nestled in the midst of the Himalayas, home to the world's tallest peaks, including Everest (29,029'). It is a land of spectacular scenery, ancient Buddhist monasteries and some of the best trekking, mountaineering, and river rafting on earth. 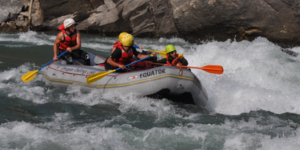 MGI programs here offer a chance to experience the incredible Sherpa culture, trek through the awesome panorama of the Himalayas, climb among the tallest peaks of the world, and raft awe inspiring whitewater on some of the world's biggest rivers. Develop the skills as a whitewater paddle captain and oarsmen. Earn a swift water rescue certificate while exploring Bote Kosi, Sun Kosi and the surround area. A great way to experience the culture of Nepal! Ascending into the upper Khumbu, the backdrop of Mt. 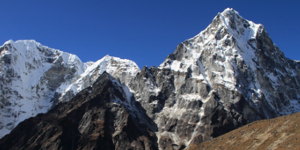 Everest, Lhotse, and Ama Dablam have inspired mountaineers like few other places. 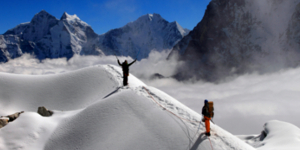 The peaks of Lobuche (20,075ft/6,119m) Imja Tse or Island Peak (20,285ft/6,183m) and Mera Peak (21,247ft/6,476m) offer a world class mountaineering classroom for students on an IWLS Nepal mountaineering course.